What's cooler than being an actual astronaut? Being an astronaut who loves his dogs. 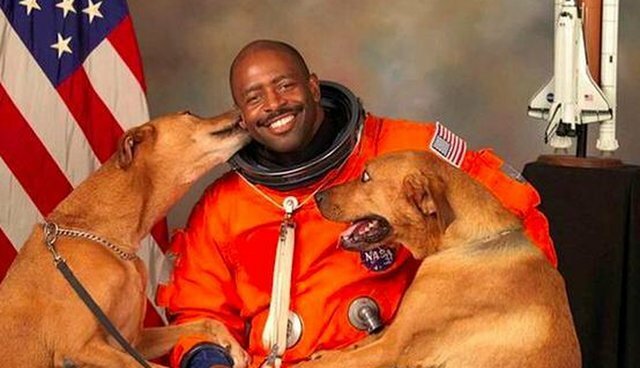 Reporter Adam Aton discovered (presumably during some non-dog-related research) that astronaut Leland Melvin posed with his dogs in his official NASA portrait. Melvin (who has been to space twice!) revealed via Twitter that he snuck his dogs Jake and Scout into the studio when his photograph was being taken. In addition to being proud daddy to Jake and Scout, Melvin has also met Elmo. And Pharrell. That, people, is a true American hero.